Jeris Miller of Yutan won $130,000 playing Nebraska Pick 5 from the Nebraska Lottery. Miller purchased her winning ticket from Cubby’s at 546 County Rd. in Yutan. The ticket contained one play with the winning numbers (11, 14, 18, 21, 28) from the May 15 drawing. Miller said she hadn’t checked the numbers yet when she got a call from her daughter telling her there was a winner in Yutan and offered to help her check the numbers. Her daughter drove her from Yutan to the Nebraska Lottery office in Lincoln to claim her $130,000 prize on Monday afternoon. 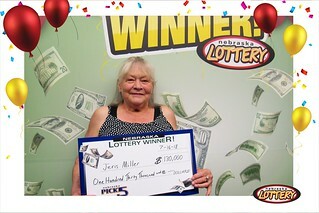 Miller, who has owned and operated Jeris’ Cafe in Yutan since 1978, said that the money from her Nebraska Pick 5 jackpot will help her to retire soon. She’s not sure when she’ll be selling the business, but said that the win has made the decision a little easier. Nebraska Pick 5 is Nebraska’s unique Lottery game: all the proceeds from Nebraska Pick 5 stay in Nebraska, and all the winning tickets are sold in Nebraska at Nebraska Lottery Lotto game retailers. The odds of winning the Nebraska Pick 5 jackpot—which starts at $50,000 and grows by $4,000 each drawing that is not won—are one in 501,942 while the overall odds of winning a prize in the game, which has drawings seven nights a week, are one in eight.